In a saucepan, cook the sugar and half the water until the mixture has a nice golden brown color. Add the remaining water and cream. Simmer for 2 minutes. Cool completely. Set aside. In a bowl, beat all the ingredients until smooth. Set aside. Butter two 23 x 13-cm (9 x 5-inch) loaf pans. In a bowl, cream the butter and sugar with an electric mixer. Add the eggs, vanilla extract and beat until smooth. In a bowl, combine the flour and baking powder. Stir the dry ingredients into the previous mixture alternately with the milk. Divide the batter in half. Add the cocoa powder and the additional milk in 1 portion of the batter. Stir to blend gently. Spread the chocolate batter into a loaf pan and the vanilla batter in the other. Bake in the middle of the oven for about 30 minutes or until a toothpick inserted in the centre of the cake comes out clean. Cool slightly, then unmould. 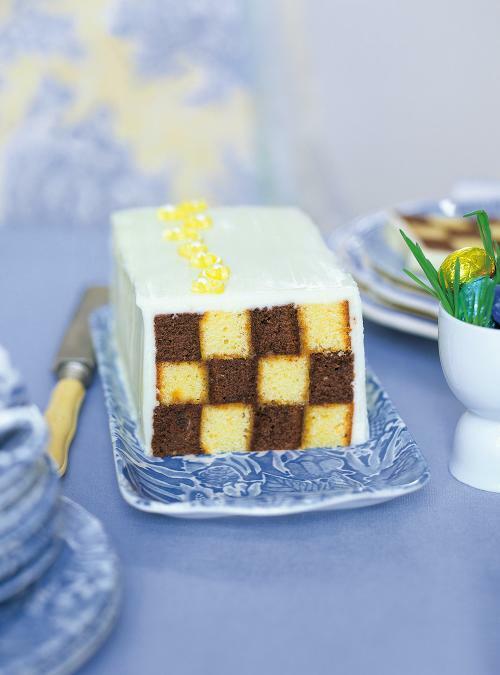 With a bread knife, slice off the rounded top of the cake. Slice the cake in half horizontally. Layer alternately slices of chocolate and vanilla cake. Spread caramel between each layer, so that they adhere to each other. With the knife, level the sides of the cake. Then slice the cake vertically into three long pieces. You will get three slices of cake alternating vanilla and chocolate. Lay a slice of cake flat and cover with a little caramel. 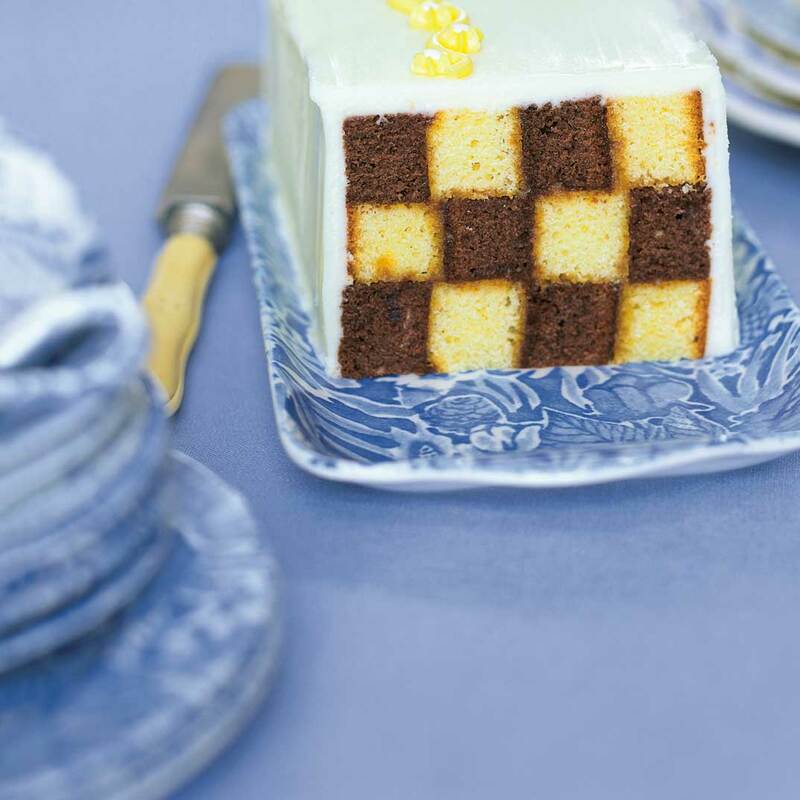 Layer with the remaining cake slices, taking care to alternate the colors to form a checkerboard and cover well with caramel between each layer. Frost the cake. You can add food coloring to one part of the frosting to add a touch of pastel as on the picture. To avoid spreading the chocolate cake crumbs while frosting, first spread a thin layer of frosting with a spatula. Let dry for 10 minutes, then spread the remaining frosting. A little challenging but once you get the hang of it not as difficult. It's a piece of cake.